Hello everyone! 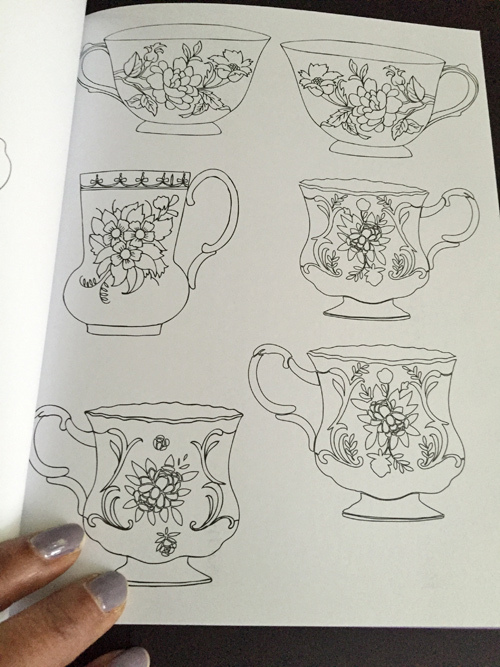 It’s day 8 of the 30 day coloring challenge. Woohoo! I made it a whole week of coloring an hour a day. Yesterday was the shortest day due to Superbowl lovin’! But I’m back now and shaking it up a bit with some coloring book coloring. When I saw this coloring book at Marshalls I just knew it had to be mine and the price of $4.99 made my wallet happy. 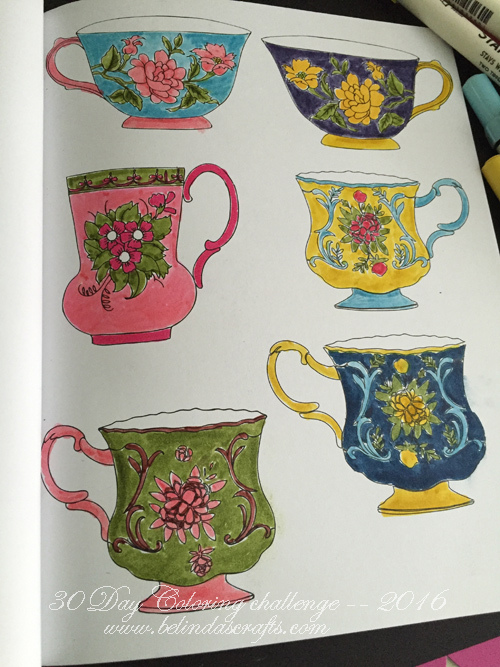 As a tea lover, I was excited to get a chance to color my own tea cups. 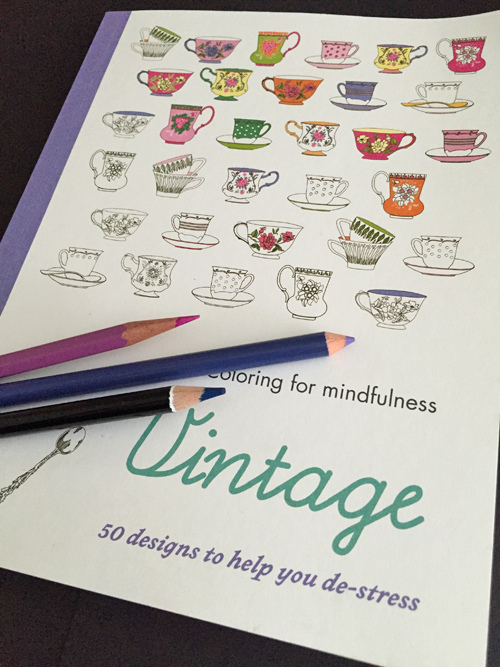 The book actually has a variety of vintage images of objects, buildings and flowers. So I don’t think this one will bore me. I started off coloring with of the color pencils from The Board Dudes but I didn’t like it at all. So I ended up using some old Distress makers and American Craft’s Stamp makers. The paper in this book is really thick so I was pleased to see no bleeding through. So next time, I might try my Copics. Which will give me much more color options. Some of the old markers had pretty used tips so staying in the lines wasn’t always very easy. I am so used to the blending and shading I can do with Copics so this was a challenge to use these markers. But I do like the end result and like the idea of completing the whole page since it is a relatively small book. Today the boys had another snow day so this might be it for today but I will be back tomorrow. OMG I love this! I want all those teacups! Very pretty coloring! Thanks Ashley. 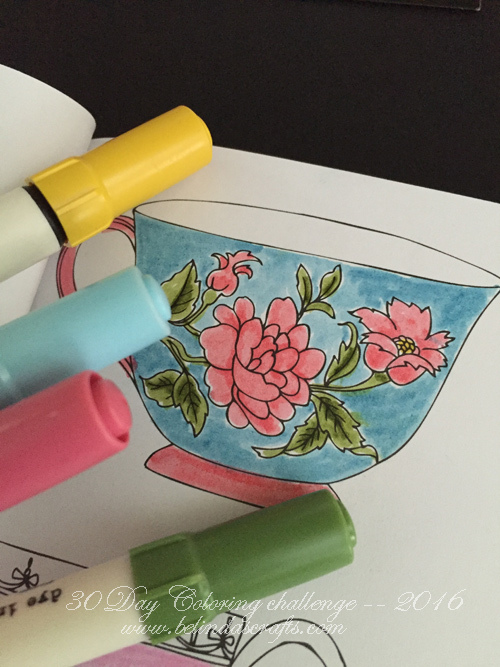 I thought of you when I colored the two pink and green tea cups! !